The JSE inched higher on Tuesday, mainly on the back of gains recorded among JSE-listed miners. Platinum group metals miners on the advanced as palladium surged to briefly break above $1600/Oz, peaking at $1601.52/Oz. Other metal commodity prices, such as gold, were also firmer on the day. This helped the Resources index to close among the day’s biggest gainers. Sentiment across Europe and the USA was also bullish as market participants anticipate a more dovish stance from the US Fed’s policy statement on Wednesday, which will incentivize investors to seek riskier assets such as stocks. On the JSE, Tongaat Hulett [JSE:TON] closed among the day’s biggest movers after it gained 10.52% to close at R18.80. African Rainbow Capital Investments [JSE:AIL] managed to record gains of 8.16% to end the day at R5.30, while Sasol [JSE:SOL] added 3.51% to close at R451.84. Diversified miner Anglo American PLC [JSE:AGL] advanced 1.57% to close at R381.51, while its industry peer, the BHP Group [JSE:BHP], gained 0.75% to close at R339.69. Impala Platinum [JSE:IMP] added 2.56% to close at R67.22, Anglo American Platinum [JSE:AMS] firmed 1.1% to R810.00, and Kumba Iron Ore [JSE:KIO] closed 1.36% higher at R394.94. Another downward trending session ensued for Ascendis Health [JSE:ASC] which came under significant pressure eventually closing 11.56% weaker at R3.98. SA Corporate Real Estate [JSE:SAC] fell 2.82% to end the day at R3.45. The sector wide pessimism spread to Hyprop Investments [JSE:HYP] which fell 5.44% to close at R74.58, as well as Accelerate Property Fund [JSE:APF] which lost 2.42% to close at R3.22. The weaker rand saw banks trading mostly weaker on the day. The Absa Group [JSE:ABG] dropped 3.97% as it closed at R160.49, while Nedbank [JSE:NED] lost 3.45% to close at R252.28. Massmart [JSE:MSM] weakened by 3.38% to close at R82.10, while Pick n Pay [JSE:PIK] closed at R66.65 after dropping 2.36%. 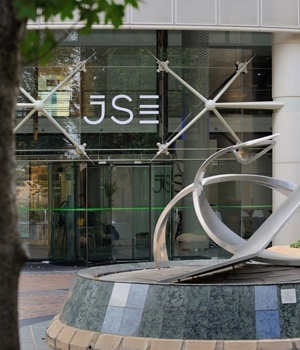 The JSE All-Share index eventually closed 0.14% firmer while the JSE Top-40 index gained 0.17%. The Resources index led the day’s gains eventually closing 1.31% higher, while the Industrials index notched up 0.23%. The Financials index came under pressure to eventually close 1.51% weaker. The rand traded mostly firmer on the day, managing to reach a session high of R14.33/$. The local currency came under pressure from the stronger US dollar which saw the rand retreat to trade at R14.44/$ at 17.00 CAT. A volatile session ensued for brent crude as it surged to a session high of $68.20/barrel before it came under pressure and pulled back to trade 0.19% softer at $67.41/barrel just after the JSE close. At 17.00 CAT, Gold was up 0.31% to trade at $1307.78/Oz, Platinum was 1.33% firmer at $847.44/Oz, and Palladium had gained 0.22% to trade at $1582.49/Oz.